Join Oregon Business for a dynamic discussion exploring the importance of Corporate Social Responsibility. 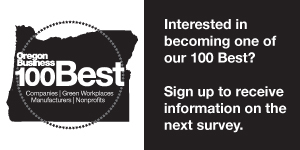 We will also recognize the 100 Best Green Workplaces in Oregon at our annual awards luncheon. This is a separate event with details to be available on March 15th. Purchase a combination ticket to the morning seminar and luncheon and save. More in this category: « Who's getting left behind in the mobility services revolution?